Another advantage of the Aquo project is the availability of original modules with curved doors and personalised handles. Original design for the curved Aquo washbasin cabinet: a wall-mounted unit featuring an ususal form with a distinct personality. 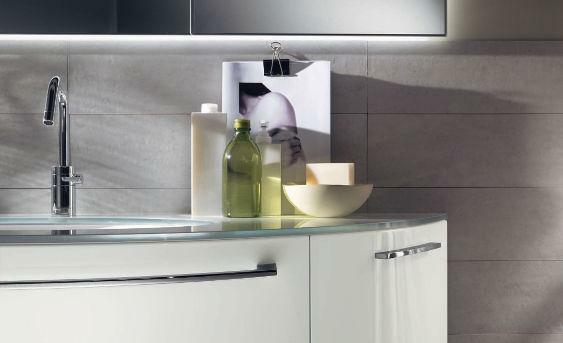 The bases in this composition are in glossy lacquered Absolute White; the top, in the same colour, is of polished glass with oval ceramic “Detail” washbasin. These shower enclosures fit perfectly into any space, and the soft lines of the ceramic fixtures elegantly complement the Aquo furnishing project.